Gymnastics can be enjoyed at the social level or at the competitive level by both young men and young women. Focusing on both personal development and on teamwork, gymnastics is one of the many sports that can help youngsters develop both fitness and camaraderie. Family members can support their gymnast with gifts of gymnastics art, as well as words of encouragement. The art can come in many forms. Word Wall Art - Perhaps originating in the classroom with a Kindergarten “word wall” that shows the words students know, gymnastics word wall art includes words that push toward positive self-development. A young gymnast must put in several hours a week practicing and working toward the improvement of form and fitness. Silhouettes - Whether carved from metal, wood or peel and stick vinyl, a silhouette of an active gymnast demonstrates the art of gymnastics and shows pride in learning an activity that requires physical prowess, coordination and sometimes a sense of timing. Gender neutral silhouettes make excellent decorations for the entry to a gym or similar training facility. Holiday Ornaments - Show your appreciation of a hard-working gymnast with seasonal ornaments that feature your gymnast’s name, a calendar date and perhaps the name of an event. Holidays are often a time when your gymnast will be busy with shows and demonstrations. A personalized ornament acknowledges that hard work. Sophisticated Art Works - Degas immortalized ballet dancers; should you do any less for gymnasts? Gymnastics is both a sport and an art-form, combining athleticism with gestures and poses not unlike ballet. Paintings and prints make ideal graduation gifts or decorations for a first apartment, as well as art for a young gymnast’s room at home. You can make your gymnasts day with gifts that show your appreciation of his or her hard work and accomplishments. Whether your gymnast is having fun with a baby class in tumbling or working on backward handsprings for competition, he or she will appreciate room decorations that acknowledge all the hard work that goes into preparing a performance or participating in a competition. Wall decorations and stickers make a great way to display medals and can act as a backdrop for a shelf of medals or statues. 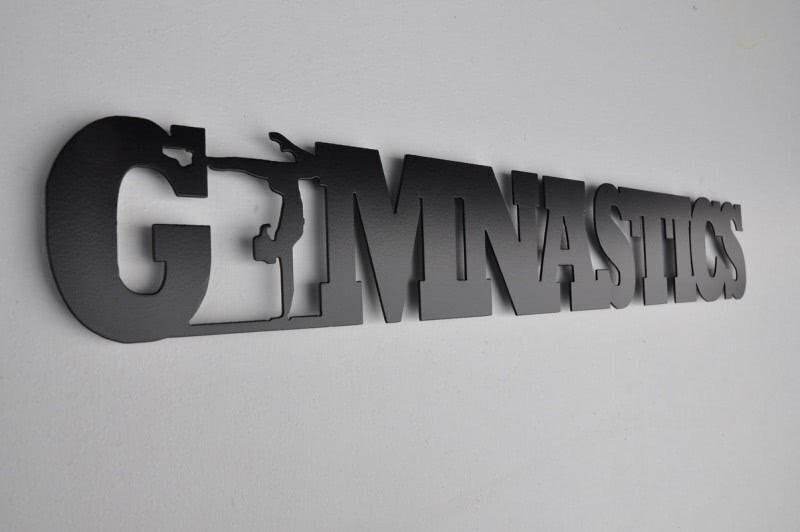 Make the day for your favorite gymnast by gifting her (or him) with the word “gymnastics” in letters laser cut from sheet metal. The letters are designed to stand out from the wall (just insert spacers on the two hanging nails and the Y is formed by an inverted female gymnast. Sure to be a hit with competitive young gymnasts. Get ready for Christmas with this pink and white resin gymnast ornament. Girl gymnast black silhouette displayed on a pink background, flanked by two stars and surrounded by a banner ribbon. You can really make her day by adding her name – also great as an award or participation token for a contest or event. Commemorate your favorite pint-sized gymnast with a little girl gymnast. The little girl is wearing a blue and white competition leotard, has her hair up in two ponytails, and is daintily posed with pointed toe and outstretched hands. This is a good gift for a budding gymnast or for a parent or grandparent of a gymnast. The bar at the bottom provides space for personalization. Create a beautiful word wall with this one-time use decal. It is easy to remove, but cannot be reused. No particular background required – other than it should be a light color, but might have difficulty sticking to porous materials. For a more permanent, place on poster board in your gymnast’s favorite color and add a decorative frame. Make her day with a “Born to Tumble” pink, white and black peel and stick wall decal. This decal adds words to live by, such as Focus, Hard Work, Intensity, Strength, Dedication and Balance, neatly distributed above the word Gymnastics and interspersed with tumbling teen-age girls. A strong reminder of what gymnastics can do for a young woman. This is a strongly sculpted design from Cyan showing a young man doing a handstand on the palms of another man. An excellent decoration for a young man who is going into a sport that is often gender-centric as a reminder that a gymnast can be male, and that male competitive gymnastics are different from females, even though there are similarities. This figurine is a reminder that male gymnastics focus a lot on upper body strength. The resin and wood figure is captured in the middle of a Pommel Horse exercise, with both legs outstretched, and the body supported completely by the arms – a position that would be held only briefly during a competition, en route to other positions. It’s an excellent piece for an award. Black silhouette of a young gymnast caught in mid-leap. The piece is advertised as “gender-neutral”. The black vinyl decal is easy to apply and easy to remove, and can be reused after removal. This is a fast and easy way to personalize your space if you are a gymnast or a gymnastics fan. It is a quick, easy way for your family gymnast to personalize his or her room. Easy to apply to any flat, clean surface this peel and stick decal from Fathead is reusable. It is advertised not to leave any sticky residue on walls – always good news in a rental – it can be removed and reused if you must relocate, or even if you just want to rearrange the room. Ideal gift for an upper level or even an aspiring gymnast, this four-panel print on canvas expresses pride in gymnastics with a greater level of sophistication than simple prints or silhouettes. This would make an excellent decoration for a college dormitory room or for the entry to a gymnastics school. The picture is printed on cotton canvas with no pixelation.